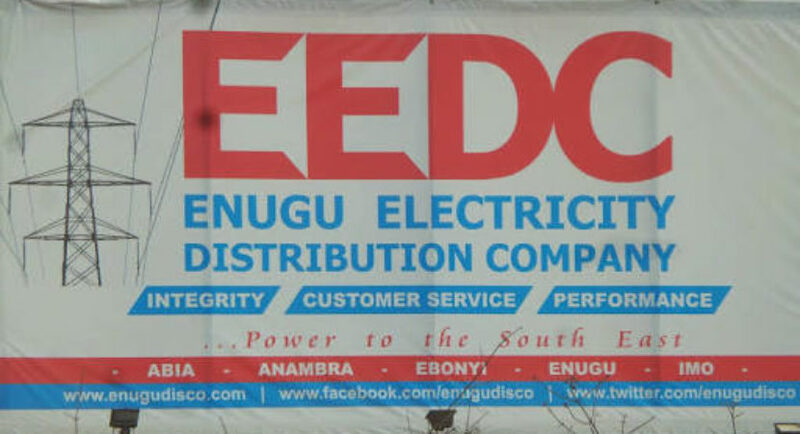 The Enugu Electricity Distribution Company, EEDC, has restated its stand on the controversy over power distribution within the Ariara Market. The contention is between the EEDC and Ariara Market Energy Solution Limited (AMESL), a company spearheading the Ariaria Independent Energy Distribution Network, IEDN. It was gatgered that the Rural Electrification Agency (REA), an Agency of the Federal Government had announced plans to initiate a rural electrification programme, whereby it proposed grid power generation and distribution to Universities and some strategic markets, including Ariaria Market in Abia. However, it was later learnt that the company licensed to operate within the Ariaria Market was private investor and not government-owned. Besides, the EEDC is also canvasing that the Ariaria area of operation is within its business circle and that it was not ready to concede same to any other company. The company said to fight the alleged trespass, it had sent a Notice of Objection dated 15th March 2018 to NERC, and had as well instituted legal proceedings at the Federal High Court of Nigeria, Umuahia Judicial Division seeking declaratory and injunctive reliefs as well as damages. Already, the court presided over by D.E. Osiagor has granted an order of interim injunction restraining the AMESL from constructing or continuing the construction of an Independent Electricity Distribution Network within EEDC’s electricity distribution licensed area. Also, in a statement by EEDC management, made available to Orient Daily by its head of communications, Mr. Chukwuemeka Ezeh, titled: “Setting the Record Straight”, the company recalled that “between 2003 and 2010, there were a number of incidents of fire outbreak at the Timber Market in Ariaria Market, which usually damaged the electricity distribution facilities in the area. The damaged facilities include: the 300KV substation, low tension poles, insulators and aluminum conductors worth several hundred millions of Naira. As a result of this, the attention of Abia State government was necessary to provide a lasting solution to the incessant fire outbreaks. It was subsequently agreed that the Timber Market would be relocated. “Before the relocation was effected, the privatisation occurred and the franchise was handed over to the Core Investor, Interstate Electrics Limited. The situation of Ariaria Market was brought to the attention of the Board of Directors. The Board duly approved funding towards the rehabilitation of the facilities destroyed by the fire outbreak. “The efforts to commence the refurbishment, replacement and reconnection of the traders in Ariaria Market were however constrained by a suit filed at the Federal High Court Abuja by Geometrics Aba Power Limited, claiming that the Federal Government of Nigeria had in 2005 granted it a lease over the assets and customers in Aba and Ariaria geographical area, and as a result their company was entitled to manage, upgrade, refurbish and administer customers within the said geographical area. The suit also sought several injunctive reliefs against EEDC regarding the Aba/Ariaria geographical area. “Owing to the pendency of the suit, and the various injunctive reliefs being claimed before the Court, EEDC was unable to continue its investment plans to refurbish, replace and reconnect the customers in the Ariaria market. “Sometime in March 2016, the Honourable Minister of Power and the Office of the Vice President of Federal Republic intervened and brokered an out of court settlement between the parties which culminated in execution of a Term Sheet between the parties in April 2016. The fulfillment of the settlement terms however did not come to fruition due to the inability of Geometric to meet their commitment to Interstate. Consequently, in late 2017, EEDC went ahead to make some investment in the network, when it became obvious that Geometric has reneged in its commitment to Interstate; having waited for 18 months for a commitment that was due in April 2016. “The Rural Electrification Agency (REA), an Agency of the Federal Government of Nigeria, subsequently initiated a rural electrification programme whereby it proposed off grid power generation and distribution to Universities and some strategic markets including Ariaria Market in Abia. This initiative was publicised in some electronic and print media, stating that the REA had commenced technical studies of the identified project areas. “With due consideration that the Federal Government of Nigeria still owns 40% shares in its business, EEDC planned to negotiate with the Rural Electrification Agency (REA) with regard to the distribution of electricity in the Ariaria Market geographical area as REA does not possess a distribution license and neither are they empowered to build a distribution network. “Contrary to the understanding that it was REA that was developing the off-grid power project at Ariaria Market, as published by the Agency in some print and electronic media, EEDC was surprised to notice that a company known as Ariaria Independent Energy Distribution Network Limited had sponsored a Public Notice in New Telegraph Newspaper dated January 24, 2018, announcing that it had applied to NERC for an Independent Electricity Distribution Network License for Ariaria market. “Concerned by this development, EEDC conducted several searches at the Corporate Affairs Commission and discovered that Ariaria Independent Energy Distribution Network Limited is a private enterprise with convoluted shareholdings comprising of several companies and shareholders respectively and is indeed a Special Purpose Vehicle for a private off grid electricity power project by private interest groups, and not by the Federal Government as earlier presented to members of the public. “In fact, what had been assumed was a government initiative by REA metamorphosed into a purely private sector business detailing the names of a chain of companies and shareholders as stated above. “Furthermore, EEDC is not aware of any transparent procurement process by REA that assigned the project, which was ostensibly conceptualised and funded by the government, to private developers. It is noteworthy that as a socially responsible company, EEDC upgraded and refurbished the Shoe Market which adjoins Ariaria Market; and Ariaria was to follow before REA announced their intention to develop the Market in the hope that they will hand the network over to EEDC after development. The company insisted that “by this singular act, Ariaria Independent Energy Distribution Network Limited encroached and trespassed on EEDC’s distribution licensed coverage area by illegally constructing distribution lines without a license nor the authorization of EEDC. “This act is in clear contravention of the regulatory provision that no company can set up a distribution network within a franchise area of a distribution company where there is already an existing and active distribution facility in the area. Furthermore, there are various conditions to be fulfilled for an intending applicant under the NERC Independent Electricity Distribution Network Regulations, 2012 and the NERC Regulations for Mini-Grids, 2016. These conditions however do not appear to have been fulfilled by the applicants. “It becomes expedient to reiterate that it is an illegality and indeed an unlawful act for any organisation to attempt to embark on the construction of an independent electricity distribution network within EEDC’s licensed coverage area in contravention of extant regulatory provisions. “Having set the record straight, we are unable to comment further as the matter remains subject to litigation. We hope to provide further clarification in due course and appreciate the patience and understanding of our esteemed customers as we strive to deliver on our unequivocal and unwavering mandate to deliver power to the South-East,” it further stated. Meanwhile, one of the investors in AMESL, Ubani Nkaginieme, had told Business Day that AMESL was aware of moves in a court in Umuahia against the Ariaria Project. He, however, described the Ariaria experiment as a blessing to the Enyimba City and a win-win to the traders, the association, the investor (AMESL), the Abia State government, and the federal government. He said all the necessary approvals were obtained, but that their lawyers would do the needful as soon as AMESL was duly served.